I realise that it’s been some time since the last blog update. This is despite a temporary and unplanned change in my employment status which, as it happens, came at a very good time with so much to do. Luckily right now it’s a blustery, showery Sunday afternoon so I can happily come inside for a change without feeling like I am neglecting the outside jobs! After finally taking delivery of the wood for the path edges there has been some further progress with the remaining work to finish off the new beds.The edging is now in place all around the outside so the paths can be properly completed as soon as the weather allows. Around half of the slate chippings have been wheelbarrowed in and it’s starting to take shape but there is just the small matter of shovelling the other 2 tonnes. 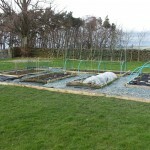 Weather permitting that will be tackled this week so all the work is completed before any more planting takes place in the raised beds. I have sown a range of seeds at irregular intervals since mid-March with the earliest seeds kept in the loft room which should be a fairly warm place to encourage germination. Today it was the turn of a few dwarf French Beans to get sown into pots and more will follow at a suitable interval to prolong the crop I hope. 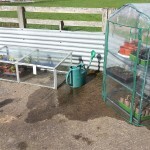 So far the cabbages, carrots and leeks are all doing well having survived the move outside to the cold frame. 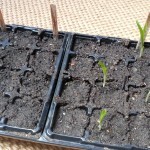 The sweetcorn is just getting going although the germination rate is a little disappointing. Those will have to stay indoors for a while longer I think – this is the North Pennines after all! 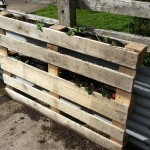 Another recent addition to the seed and cutting area was a simple strawberry pallet as a trial. A simple use for a pallet but if it works then I intend to have a go at the better pallet planter on the Lovely Greens blog at some point in the future. With the eager assistance of some weekend visitors another section of the woods has been cleared and the larger trunks or branches stored away under cover for next years firewood. The job would have taken a lot longer without the help and if I’m honest might not have been started until much later in the year! 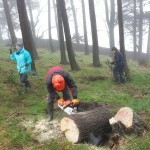 The chainsaw and log splitter are being deployed at regular intervals to work through the pile whenever time allows. Given such a delay in updates I think a gallery of photos is needed to give a better overview of the general progress on all fronts.